Rastogi, R., et al. Diffusion Tensor Tractography (DTT) – An Objective Method of Determining Clinically Relevant, Compressive, Spinal Cord Myelopathy. (2016) Int J Neuro Brain Dis 3(3): 1- 5. © 2016 Rastogi, R. This is an Open access article distributed under the terms of Creative Commons Attribution 4.0 International License. We commonly come across cases of compressive spinal cord myelopathy (CSCM) due to variety of clinical conditions in our day-to-day radiological practice. Magnetic resonance imaging (MRI) has long been considered as the gold-standard imaging tool for evaluation of such cases. These cases reveal signs of spinal cord compression with or without alteration in spinal cord parenchymal signal alteration. Though, diffusion tensor imaging especially fiber-tracking or tractography has been described to be superior to routine MRI in predicting prognosis and urgency of decompression yet fewer studies have been conducted to demonstrate it especially in developing world. Hence, this study aims to evaluate diffusion tensor tractography (DTT) as an advanced dimension of MRI in patients with CSCM in predicting necessity of decompression management, predicting prognosis and evaluating post-decompression outcome objectively in simplified manner. Compressive Spinal Cord Myelopathy (CSCM) refers to the neurological deficit arising secondary to the compression of spinal cord. Causes include posterior marginal osteophyte, extruded disk, epidural collections, distracted fracture fragment & benign or malignant spinal tumors. Clinical evaluation consists of categorizing symptoms to acute & chronic groups; localizing symptoms to a particular level in spinal cord and excluding brain as well as peripheral nerve involvement. Imaging especially magnetic resonance imaging (MRI) plays a pivotal role in confirming & localization of compression site and determining its cause. Conventional MRI consisting of T1 & T2 weighted images with their variants form the main basis of radiological evaluation but as these images are affected by multiple acquisition parameters, they fail to objectively assess the functional and morphological integrity of spinal cord fiber tracts, the information that directly affects management and prognosis. With modern 1.5 and 3.0 Tesla MRI scanners, it is now possible to objectively assess CSCM with diffusion tensor imaging (DTI) which provides quantitative structural assessment of white matter fiber tracts within the spinal cord. DTI involves calculation of apparent diffusion coefficient (ADC) values; fractional anisotropy (FA) values and diffusion tensor fiber tractography (DTT). DTT provides direct, objective, in vivo, 3-dimensional, color-coded assessment of integrity spinal cord fiber tracts (figure 1). Hence in this article, we share our experience on DTT in CSCM due to variety of clinical pathologies. Figure 1a-c: Midline sagittal T2W MR image of whole spine in a normal patient (a) shows homogeneous, blue-colored, fiber tracts in sagittal (b) and coronal (c) planes. Patients with clinical signs of CSCM visiting the department of Radiodiagnosis from April to July’2016 were randomly selected for our study. All the selected patients underwent conventional MRI and DTI examination utilizing at least 20 gradient directions including DTT in the suspected region of spine with a high-resolution matrix on 1.5T magnet system. 3D-color coded maps were obtained sagittal & coronal planes. Patient with traumatic spine & severe spinal pain leading to their inability to lie motionless for optimal time of scan were excluded from the study. Patients with history of spinal surgery, spinal radiation therapy and any contraindication to MRI were also excluded from the study. All the acquired images were examined by a single experienced radiologist. A separate note was made of the presence or absence of parenchymal signal alteration and change in color code of the neural fiber tracts in spinal cord in addition to the integrity and homogeneous thickness of the fiber tracts on DTT that was evaluated in sagittal & coronal (both anterior & posterior) planes. A near-homogeneous blue color in the spinal cord and cauda equina was considered normal in our study with blue color representing diffusion in craniocaudal direction and any obvious alteration in color, thickness & integrity especially at the level of compression on T2W images was taken as significant. total of 15 patients were included in our study. Out of fifteen patients, three patients were excluded from the study due to suboptimal scan quality, as the patients could not lie motionless for optimal time of examination resulting in suboptimal DTT. Out of remaining twelve patients, nine had signs of CSCM secondary to infective spondylodiskitis; one secondary to disk protrusion; one secondary to disk extrusion and one secondary to metastatic collapse of vertebra. Patients ranged from 15 to 65 years of age with eight males & four females. In eight out of twelve patients with no spinal cord parenchymal signal alteration on T2W images, DTT revealed significant alteration in color-code both at and above the level of compression signifying altered diffusion (Figure 2,3). In two out of twelve patients with compression of cauda equina, though no visible nerve signal alteration was noted yet significant color alteration on DTT was noted at & inferior to the compression level signifying altered diffusion (Figure 4). In the remaining two patients, though hyperintensity was noted in spinal cord parenchyma at the level of compression yet DTT revealed much extensive involvements of spinal tracts (Figure 5). Figure 2a-c: Midline sagittal T2W MR image of whole spine (a) in a patient with infective spondylodiskitis shows heterogeneous, color alteration of fiber tracts in sagittal (b) and coronal (c) planes at, cranial and caudal to the site of compression (arrows). 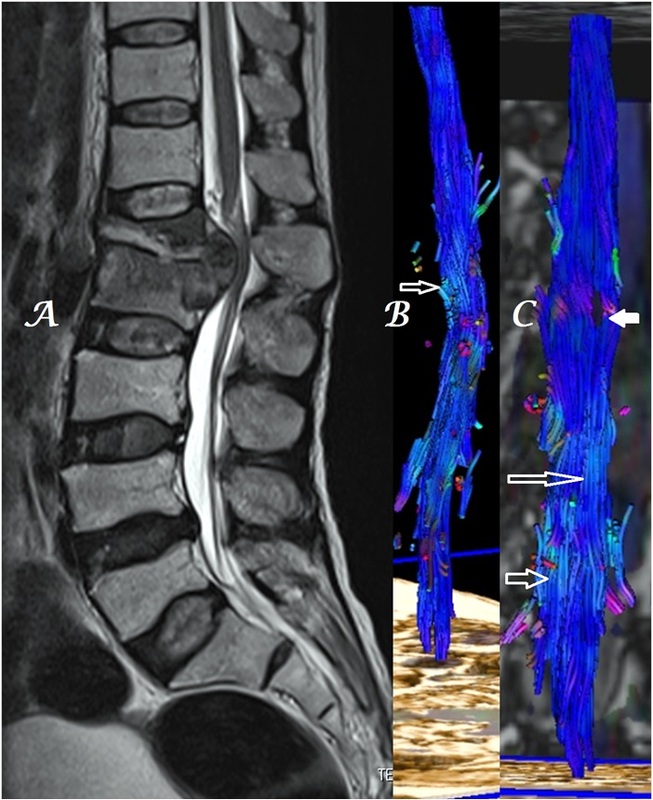 Figure 3a-c: Midline sagittal T2W MR image of DL spine (a) in a patient with infective spondylodiskitis shows heterogeneous, color alteration of cauda equina in sagittal (b) and coronal (c) planes at & below the site of compression [arrows] with loss of few fibers seen in coronal plane (c-solid arrow). 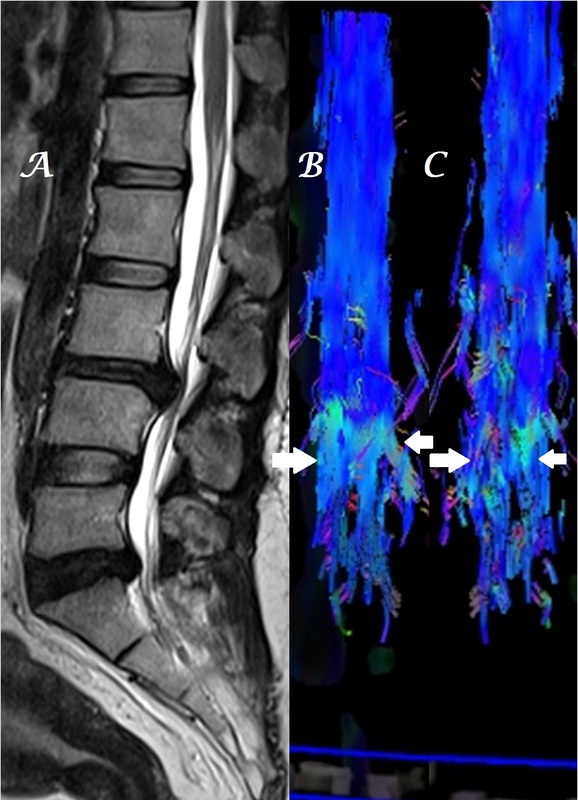 Figure 4a-c: Midline sagittal T2W MR image of DL spine (a) in a patient with spinal metastases shows heterogeneous, color alteration of anterior spinal tracts in sagittal (b) plane at the site of compression and color change in cauda equina nerves in both sagittal (b) and coronal (c) planes below the site of compression [arrows]. Figure 5a-d: Midline sagittal T2W MR images of dorsal spine (a, b) in a patient with infective spondylodiskitis & dilatation of central spinal canal above the site of compression show heterogeneous, color alteration of dorsal cord with loss of few fiber tracts as well in sagittal (c) and coronal (d) planes at the site of compression [arrows]. In patients with effacement of anterior epidural space, color change was noted in the anterior spinal tracts while in cases of significant compression, color change in both anterior & posterior spinal tracts was noted (Figure 6, 7, 8). Figure 6a-c: Midline sagittal T2W MR image of whole spine (a) in a patient with infective spondylodiskitis shows heterogeneous, color alteration of anterior fiber tracts in sagittal (b-arrows) without significant change in posterior fiber tracts in coronal (c) planes at the site of compression. Figure 7a-d: Midline sagittal T2W MR images of cervical spine (a) in a patient with infective spondylodiskitis of C1/C2 region shows effacement of anterior epidural space and heterogeneous, color alteration of anterior spinal tracts in sagittal & coronal (b, d) with no color change in posterior spinal tracts in coronal (c) plane at the site of compression [arrows]. 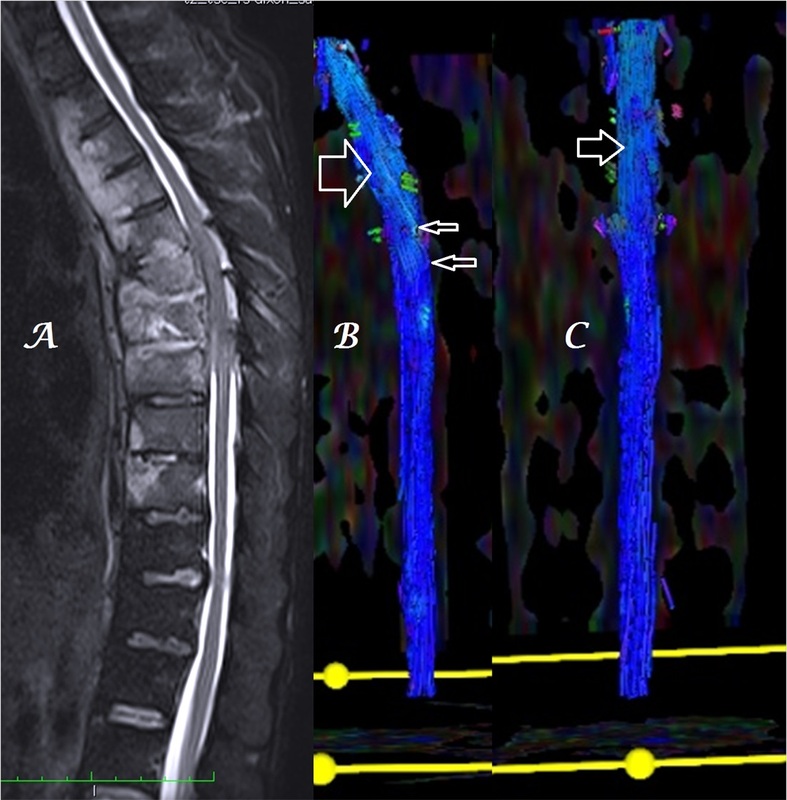 Figure 8a-c: Midline sagittal T2W MR image of LS spine (a) in a patient with L3-4 disk extrusion shows heterogeneous, color alteration of anterior (b) as well as posterior (c) cauda equina nerves at & below the site of compression [arrows]. In a single patient with associated demyelinating changes, decrease in volume & loss of integrity of spinal tracts was also evident (Figure 9). Thinning of fiber tracts was associated with severe CSCM. 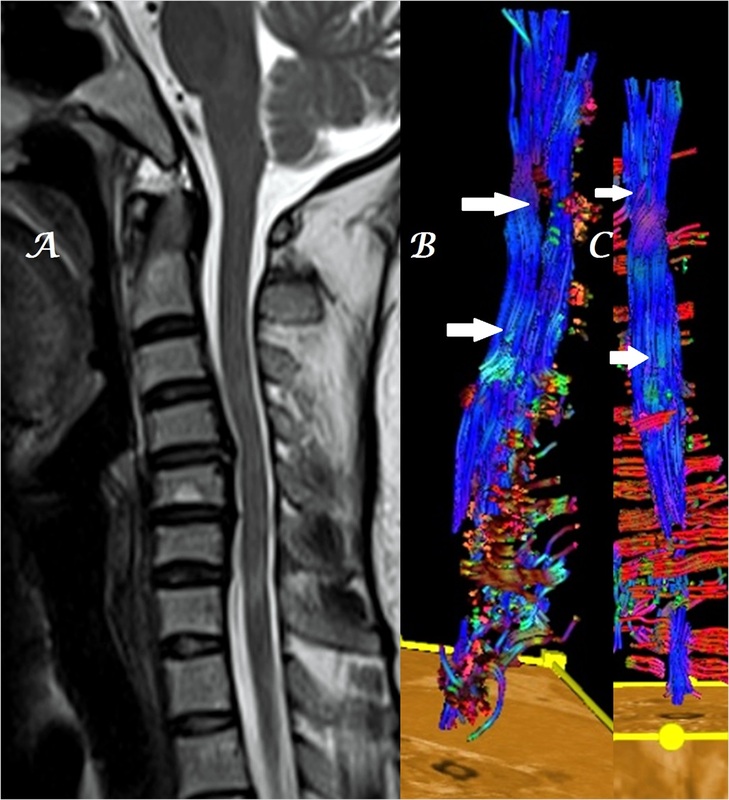 Figure 9a-c: Midline sagittal T2W MR image of cervical spine (a) in a patient with C4-5 disk extrusion shows heterogeneous, color alteration of anterior spinal tracts in sagittal (b) plane at the site of compression with loss of few fiber tracts in both sagittal (b) and coronal (c) planes due to associated demyelinating disease [arrows]. Though DTI especially DTT have limitations in spinal region yet recent advances in hardware and software technology especially the advent of 3T MRI system have enabled utilization of DTT in variety of spinal conditions including multiple sclerosis, tumors, infarction, Wallerian degeneration, etc[3-6]. DTT has also been found useful in assessing the recovery of patients with chronic spinal injury & in evaluating motor functional outcome of patients with acute transverse myelitis[7,8]. DTI has also been found useful in objective assessment of the spinal cord structural integrity in CSCM. MRI in CSCM usually reveals the level of compression with or without T2-hyperintensity which is commonly noted in late stages. The T2-hyperintensity has been reported to be a poorly sensitive index of CSCM with sensitivity varying between 15 - 60%. DTI has been shown to be superior to conventional MRI in CSCM in systematic meta-analysis of many previous small studies[12,13]. Though DTT allows three-dimensional visualisation of spinal cord tracts especially the corticospinal and spinothalamic tracts by producing color coded maps yet it utility in the spinal region is limited due to hole-effects caused by small diameter and presence of CSF-flow, respiratory & cardiac motion artefacts in spinal cord. This limitation can be overcome by using higher number of gradient directions as we used in our study. DTT not only allows precise delineation of site of compression but also assesses severity of fiber tract damage in spinal cord in form of displacement, deformation & disruption[9,13,15]. Majority of the previous studies stating the utility of spine DTI have studied the role of ADC & FA values[3,5,6,10,12,16] but not the DTT as done in few previous studies[4,9,17] and our study. As human eye is more sensitive to color than gray scale and as fiber tracts show unidirectional diffusion along their long axis, DTT may provide better, early and objective assessment than ADC & FA values which not only need to be taken at multiple locations & evaluated statistically for different races & ethnic groups but also changes with magnetic field strength of MRI system. However, as DTT is a 3D images, it evaluation from all sides is imperative. Usefulness of spinal DTI have been also suggested in predicting surgical outcome, assessing changes or progression on follow-up, segregating patients that may benefit from conservative or non-surgical methods. The major limitation is the small number of patients that were included in the study. Another limitation is lack of statistical correlation between extent / severity of DTT findings with clinical complaints as well as with individual causes of CSCM. As post-treatment (post-decompression) DTT was not included in our study, therefore our study could not evaluate the degree of reversal of DTT findings. Minor limitations include the significant increase in scan time; increase in evaluation time due to post-processing techniques and requirement of technical specifications in the machine as well as the expertise of the technologist. Spinal DTT would be technically superior on 3T magnetic system with the exception of susceptibility artefacts. The findings of our study suggest that DTT may be used as a more sensitive indicator of spinal cord compression than conventional MRI by revealing color alterations in 3D color-coded maps, thinning and loss of integrity of spinal nerve fiber tracts providing easy and fast tool to predict the need of surgical decompression. To summarize, DTT, an advanced dimension of DTI may be a useful tool in evaluating patients of CSCM due to variety of causes. It is more useful than conventional MRI and not only helps in predicting the urgency of decompression but also in predicting prognosis and in follow-up of patients treated with conservative or operative methods. However, more studies with larger number of patients and wider spectrum of pathologies along with higher field strength MRI may be required to validate the results of this study in routine clinical practice. I am extremely thankful to other MRI technologists as well viz. Mr. Navneet Singh & Mr. Rohit Frank who took tiring efforts in acquiring and achiving of MR images. 1. Clark, C.A., Warring, D.J. 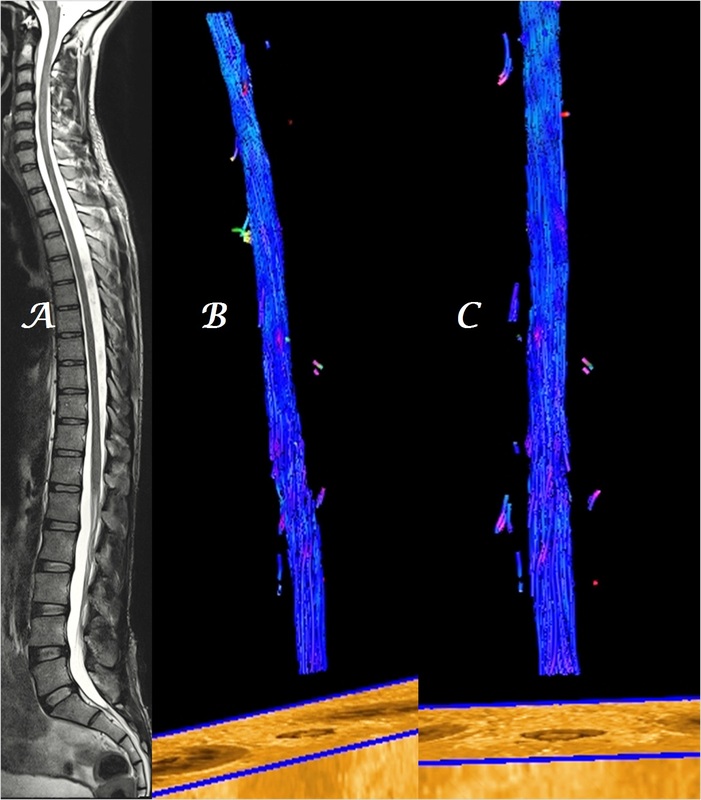 Diffusion tensor imaging in spinal cord: methods and applications – a review. (2002) NMR Biomed 15(7-8): 578-586. 2. Le, Bihan, D., Mangin, J.F., Poupon, C., et al. Diffusion tensor imaging: concepts and applications. (2001) J Magn Reson Imaging 13(4): 534-546. 3. Ohgiya, Y., Oka, M., Hiwatashi, A., et al. 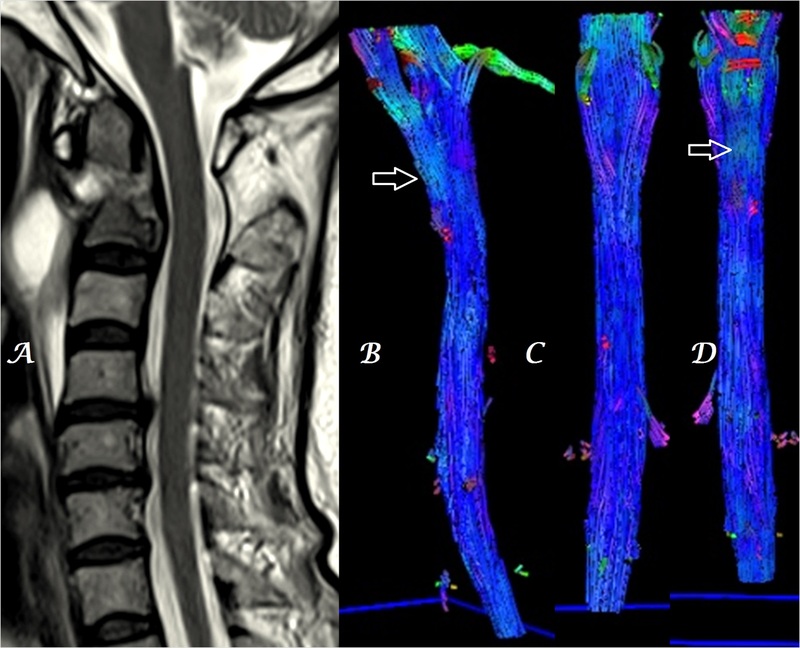 Diffusion tensor MR imaging of the cervical spinal cord in patients with multiple sclerosis. (2007) Eur Radiol 17(10): 2499–2504. 4. Ducreux, D., Lepeintre, J.F., Fillard, P., et al. MR diffusion tensor imaging and fiber tracking in 5 spinal cord astrocytomas. (2006) AJNR 27(1): 214–216. 5. Liang, Z., Zeng, J., Zhang, C., et al. Longitudinal investigations on the anterograde and retrograde degeneration in the pyramidal tract following pontine infarction with diffusion tensor imaging. (2008) Cerebrovasc Dis 25(3): 209–216. 6. Guleria, S., Gupta, R.K., Saksena, S., et al. Retrograde Wallerian degeneration of cranial corticospinal tracts in cervical spinal cord injury patients using diffusion tensor imaging. (2008) J Neurosci Res 86(10): 2271–2280. 7. Ellingson, B.M., Ulmer, J.L., Kurpad, S.N., et al. 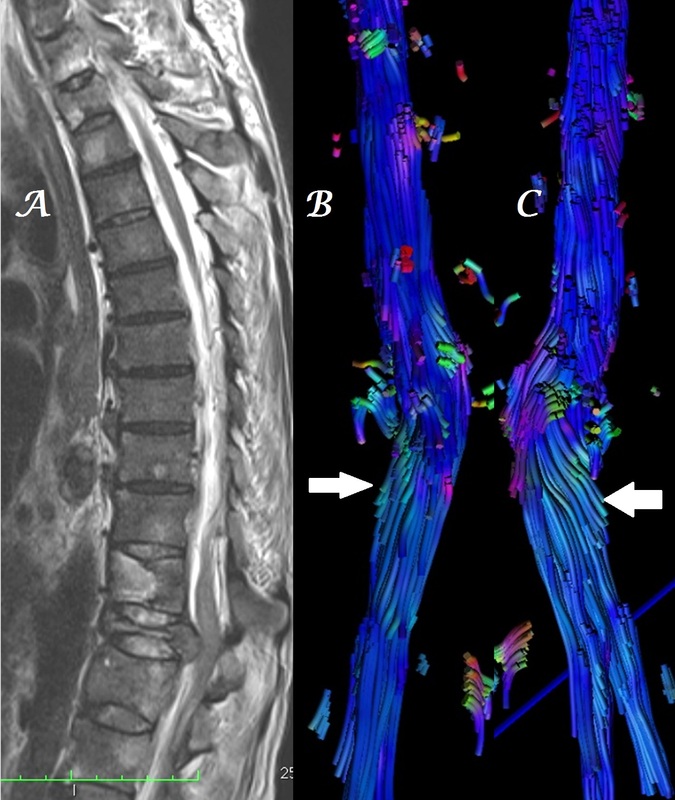 Diffusion tensor MR imaging in chronic spinal cord injury. (2008) AJNR 29(10): 1976–1982. 8. Lee, J.W., Park, K.S., Kim, J.H., et al. Diffusion tensor imaging in idiopathic acute transverse myelitis. (2008) AJR 191(2): W52–W57. 9. Facon, D., Ozanne, A., Fillard, P., et al. MR Diffusion Tensor Imaging and Fiber Tracking in Spinal Cord Compression. (2005) AJNR 26(6): 1587-1594. 10. Demir, A., Ries, M., Moonen, C.T., et al. Diffusion-weighted MR imaging with apparent diffusion coefficient and apparent diffusion tensor maps in cervical spondylotic myelopathy. (2003) Radiology 229(1): 37–43. 11. Matsumoto, M., Toyama, Y., Ishikawa, M., et al. 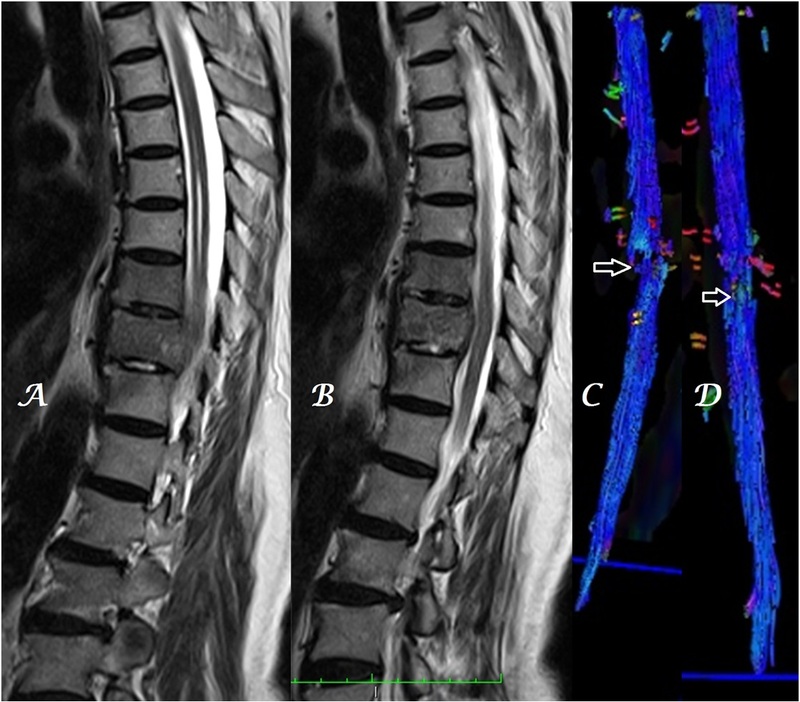 Increased signal intensity of the spinal cord on magnetic resonance images in cervical compressive myelopathy. (2000) Spine 25(6): 677–682. 12. Guan, X., Fan, G., Wu, X., et al. Diffusion Tensor Imaging Studies of Cervical Spondylotic Myelopathy: A Systemic Review and Meta-Analysis. (2015) PLoS One 10 (2): e0117707. 13. Li, X.F., Yang, Y., Lin, C.B., et al. Assessment of the diagnostic value of diffusion tensor imaging in patients with spinal cord compression: a meta-analysis. (2016) Braz J Med Biol Res 49 (1): e4769. 14. Jones, D.K. The effect of gradient sampling schemes on measures derived from diffusion tensor MRI: a Monte Carlo study. (2004) Magn Reson Med 51(4): 807–815. 15. Sasiadek, M.J., Szewczyk, P., Bladowska, J. 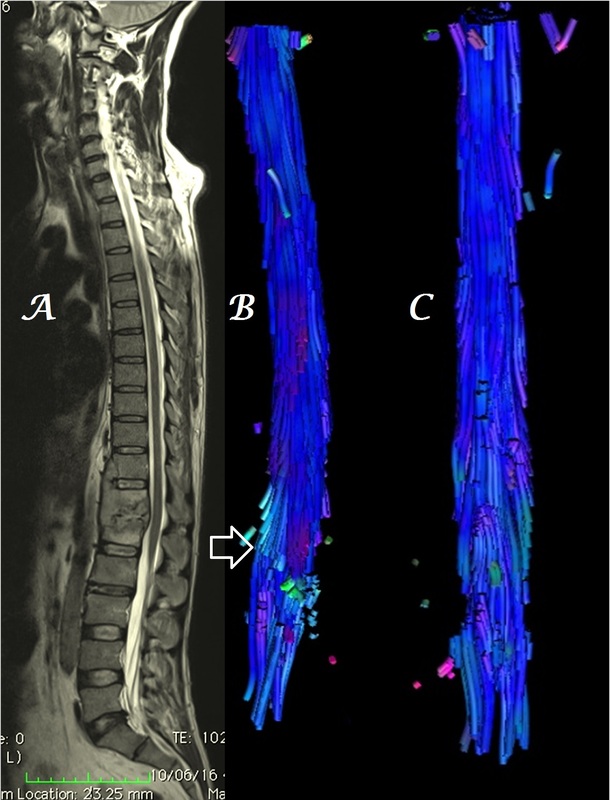 Application of diffusion tensor imaging (DTI) in pathological changes of the spinal cord. (2012) Med Sci Monit 18(6): RA73–RA79. 16. Jones, J.G.A., Cen, S.Y., Lebel, R.M., et al. Diffusion Tensor Imaging Correlates with the Clinical Assessment of Disease Severity in Cervical Spondylotic Myelopathy and Predicts Outcome following Surgery. (2013) AJNR 34(2): 471-478. 17. Amal Amin A. El Maati., Chalabi, N. Diffuse tensor tractography as a supplementary tool to conventional MRI for evaluating patients with myelopathy. (2014) The Egyptian Journal of Radiology and Nuclear Medicine 45 (4): 1223-1231.